With three family members skiing the American Birkebeiner 50k cross-country ski race this year, there was great potential for raising the level of anxiety and pre-race drama to a fever pitch. But instead, we were focusing on Rich’s medical problems – a guaranteed way to put life in perspective. An enlarged prostate that landed him in the emergency room last week didn’t stop him from planning to ski the Birkie. He continued his training with a catheter, and pressed his already-tired body to stride around the trails. Going ahead with Skiing Book Across the Bay as planned was an important psychological and emotional achievement, and his doctor and nurse were very impressed! 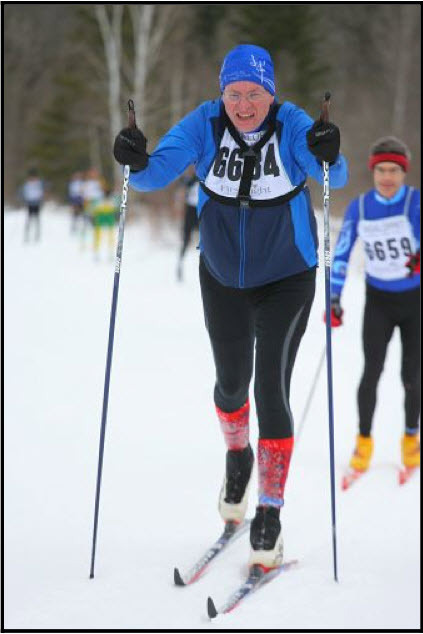 Good news came yesterday – while surgery is required, it is a week away and Rich has the all-clear to ski the Birkie. The race is still on! Better yet, he will ski catheter-free. Look out, ski cam man will return in his signature knickers. So today we entered the pre-Birkie phase with a vengeance. We’ve checked the weather forecast for Hayward numerous times. It doesn’t change much, but somehow it satisfies a need to be informed. And then there were the discussions over glide wax. A friend skiing with us offered his fancy waxes, but I don’t know what to do with wax whose name I can’t pronounce. Red and Blue are my standbys. After much consternation, emailing with Erik our son, and checking temperature ratings, I finally decided on three coats of red and a final layer of blue. Will I really know the difference? Packing for the event is my forte. My penchant for making lists does come in handy once in a while. And yes, of course I have my list from last year’s Birkie. I have no excuse for forgetting anything vital. We’ve done our final easy ski, our pasta dinner is in the works, and an early bedtime is planned. The countdown ends tomorrow. We’re ready to ski the Birkie! This entry was posted in Family Footprints, Keeping Fit and tagged American Birkebeiner, Cross-Country Skiing, Family, Ski Races by Molly. Bookmark the permalink.